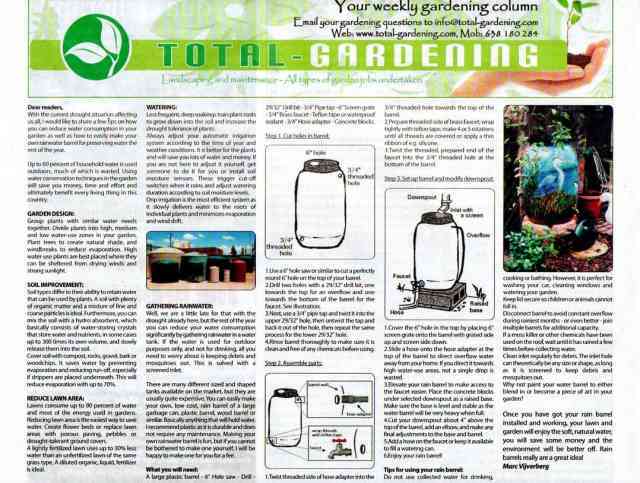 With the current drought situation affecting us all, I would like to share a few tips on how you can reduce water consumption in your garden as well as how to easily make your own rainwater barrel for preserving water the rest of the year. Up to 60 percent of household water is used outdoors, much of which is wasted. Using water conservation techniques in the garden will save you money, time and effort and ultimately benefit every living thing in this country. Group plants with similar water needs together. Divide plants into high, medium and low water-use zones in your garden. Plant trees to create natural shade, and windbreaks to reduce evaporation. High water-use plants are best placed where they can be sheltered from drying winds and strong sunlight. Soil types differ in their ability to retain water that can be used by plants. A soil with plenty of organic matter and a mixture of fine and coarse particles is ideal. Furthermore, you can mix the soil with a hydro absorbent, which basically consists of water-storing crystals that store water and nutrients, in some cases up to 300 times its own volume, and slowly release them into the soil. Cover soil with compost, rocks, gravel, bark or woodchips. It saves water by preventing evaporation and reducing run-off, especially if drippers are placed underneath. This will reduce evaporation with up to 70%. Lawns consume up to 90 percent of water and most of the energy used in gardens. Reducing lawn area is the easiest way to save water. Create flower beds or replace lawn areas with porous paving, pebbles or drought-tolerant ground covers. A lightly fertilized lawn uses up to 30% less water than an unfertilized lawn of the same grass type. A diluted organic, liquid, fertilizer is ideal. Less frequent, deep soakings train plant roots to grow down into the soil and increase the drought tolerance of plants. Always adjust your automatic irrigation system according to the time of year and weather conditions. It is better for the plants and will save you lots of water and money. If you are not here to adjust it yourself, get someone to do it for you or install soil moisture sensors. These trigger cut-off switches when it rains and adjust watering duration according to soil moisture levels. Drip irrigation is the most efficient system as it slowly delivers water to the roots of individual plants and minimizes evaporation and wind drift. Well, we are a little late for that with the drought already here, but the rest of the year you can reduce your water consumption significantly by gathering rainwater in a water tank. If the water is used for outdoor purposes only, and not for drinking, all you need to worry about is keeping debris and mosquitoes out. This is solved with a screened inlet. 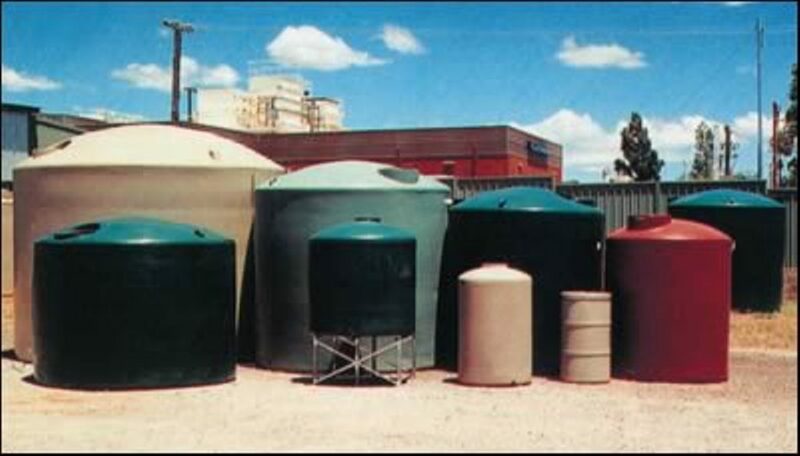 There are many different sized and shaped tanks available on the market, but they are usually quite expensive. You can easily make your own, low cost, rain barrel of a large garbage can, plastic barrel, wood barrel or similar. Basically anything that will hold water. I recommend plastic as it is durable and does not require any maintenance. 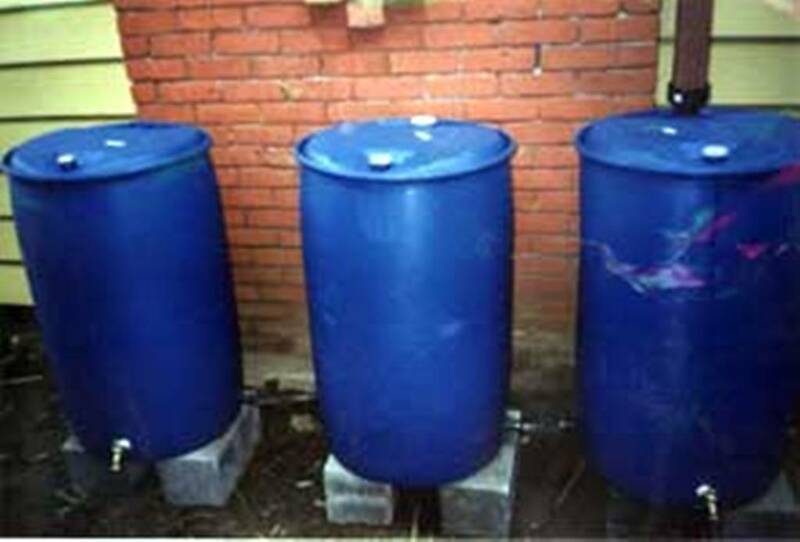 Making your own rainwater barrel is fun, but if you cannot be bothered to make one yourself, I will be happy to make one for you for a fee. What you will need: A large plastic barrel - 6" Hole saw - Drill - 29/32" Drill bit - 3/4" Pipe tap - 6" Screen grate - 3/4" Brass faucet - Teflon tape or waterproof sealant - 3/4" Hose adapter - Concrete blocks. 1.Use a 6" hole saw or similar to cut a perfectly round 6� hole on the top of your barrel. 2.Drill two holes with a 29/32� drill bit, one towards the top for an overflow and one towards the bottom of the barrel for the faucet. See illustration. 3.Next, use a 3/4" pipe tap and twist it into the upper 29/32" hole, then untwist the tap and back it out of the hole, then repeat the same process for the lower 29/32" hole. 4.Rinse barrel thoroughly to make sure it is clean and free of any chemicals before using. Step 2. Assemble parts: 1.Twist threaded side of hose adapter into the 3/4" threaded hole towards the top of the barrel. 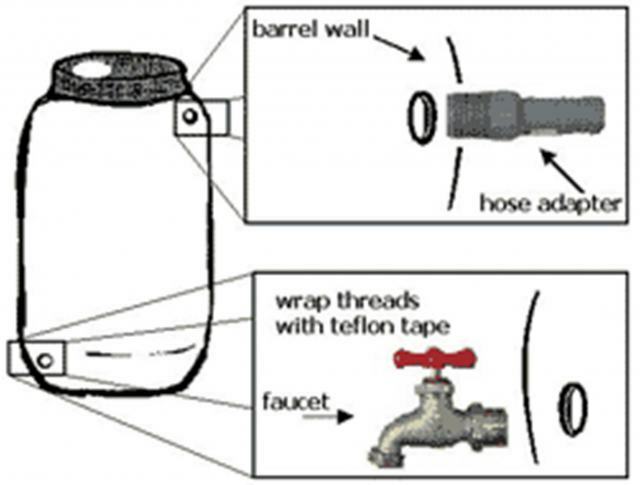 2.Prepare threaded side of brass faucet; wrap tightly with teflon tape, make 4 or 5 rotations until all threads are covered or apply a thin ribbon of e.g. silicone. 3.Twist the threaded, prepared end of the faucet into the 3/4" threaded hole at the bottom of the barrel. Step 3. Set up barrel and modify downspout: 1.Cover the 6" hole in the top by placing 6" screen grate onto the barrel with grated side up and screen side down. 2.Slide a hose onto the hose adapter at the top of the barrel to direct overflow water away from your home. If you direct it towards high water-use areas, not a single drop is wasted. 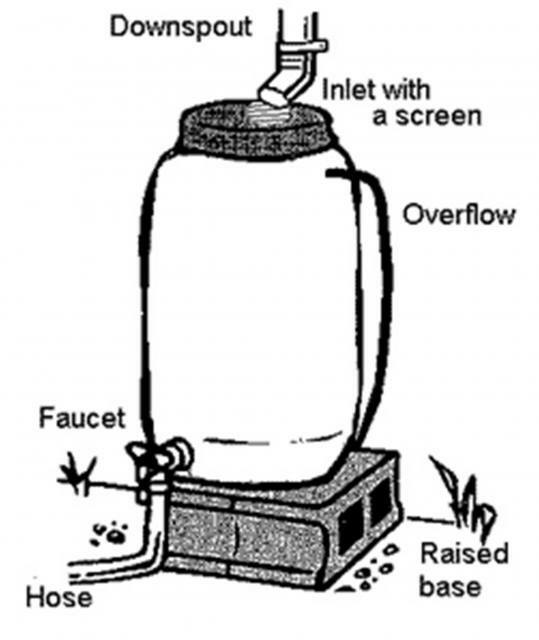 3.Elevate your rain barrel to make access to the faucet easier. Place the concrete blocks under selected downspout as a raised base. Make sure the base is level and stable as the water barrel will be very heavy when full. 4.Cut your downspout about 4" above the top of the barrel, add an elbow, and make any final adjustments to the base and barrel. 5.Add a hose on the faucet or keep it available to fill a watering can. Do not use collected water for drinking, cooking or bathing. However, it is perfect for washing your car, cleaning windows and watering your garden. Keep lid secure so children or animals cannot fall in. Disconnect barrel to avoid constant overflow during rainiest months - or even better - join multiple barrels for additional capacity. If a moss killer or other chemicals have been used on the roof, wait until it has rained a few times before collecting water. Clean inlet regularly for debris. 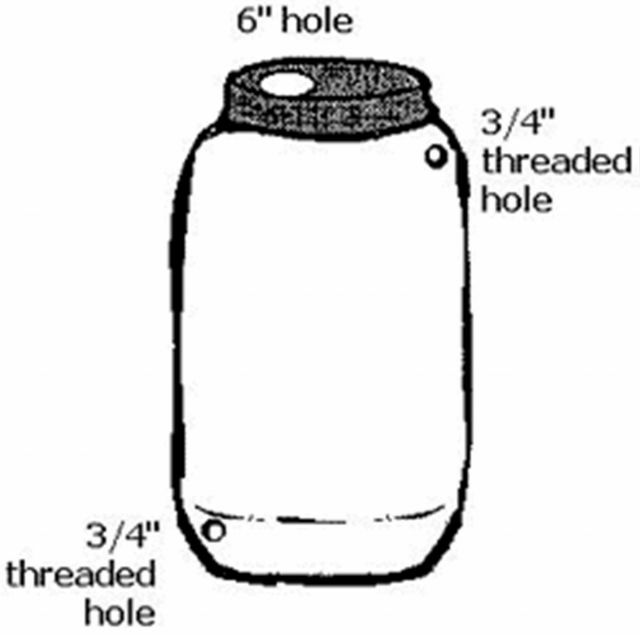 The inlet hole can theoretically be any size or shape, as long as it is screened to keep debris and mosquitoes out. 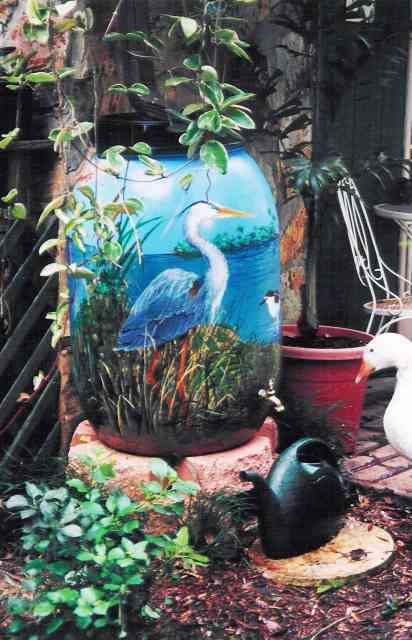 Why not paint your water barrel to either blend in or become a piece of art in your garden? Once you have got your rain barrel installed and working, your lawn and garden will enjoy the soft, natural water, you will save some money and the environment will be better off. Rain barrels really are a great idea!